This is a reprint of my review which was first published on Three Men on a Blog about 2 years ago, with a number of minor revisions. My original review can be found here. Also be sure to check out the Movie Hour podcast on the film from December 2010 here. Film critics spend a sizable part of their careers trying to convince people to judge films on deeper grounds than whether or not they are fun. But every so often a film comes along which defies all their holier-than-thou criteria, a film which laughs in the face of criticism itself. The Rocky Horror Picture Show is one of these films, and seeing it as 'just a bit of fun' is the only way to approach it. If you go into Rocky Horror wanting to analyse deep-seated themes, or unpick the dialogue to reveal some ecstatic truth, you'll sit through the whole thing either frustrated or bored and come out completely po-faced having not got the joke. If you go in looking to spot all the B-movie references, you'll enjoy it a little more, although you will look every bit as geeky as Quentin Tarantino. The only way one can really experience Rocky Horror is to take the film's advice and "give yourself over to absolute pleasure": sit back, open your mind and let the Time Warp do the rest. 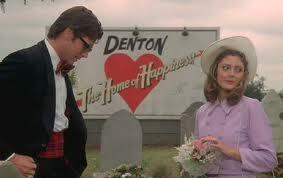 Like all the best cult films, Rocky Horror commercially underperformed when first released. And in hindsight it's not hard to see why. Much like its contemporaries (Night of the Living Dead, Pink Flamingos, El Topo and Eraserhead) it is very hard to sit through Rocky Horror in complete comfort the first time round. Part of this is intentional: several scenes are scary and the visuals are striking enough to send the uninitiated reeling. But equally there are things about Rocky Horror which (at least now) don't quite hang together or work as well as one would want. Richard O'Brien (who also stars as Riff Raff) conceived the stage show as a love letter to old sci-fi and horror B-movies; he described it as a means to relive childhood memories of Frankenstein and Nosferatu, and escape from the reality of being out of work. True to form, the opening song pays lip service to a host of old movies, from the original versions of Flash Gordon and The Day The Earth Stood Still to more campy fare like The Invisible Man, Night of the Demon, and It Came From Outer Space. The film plays out like a jumble-sale of B-movie plots, restaged with maximum camp value and more than a little affection. The creation of Rocky is a witty riff on Frankenstein; the monster remains largely mute and afraid of fire, but the master designs him as a source of pleasure rather than a means to make humans immortal. There are clear hints of King Kong in the final third, as Frank N. Furter wonders "Whatever happened to Fay Wray?" and Rocky dies from falling off the RKO Tower. The Hammer stable also runs right through Rocky Horror, solidified by the casting of Charles Gray in his most enjoyable performance since The Devil Rides Out. 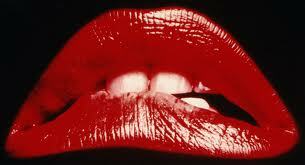 But by far the biggest influence on Rocky Horror is The Wizard of Oz, something which O'Brien readily acknowledges. 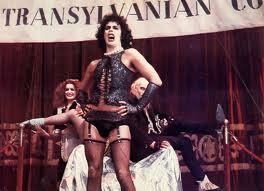 The film was originally intended to be filmed in black-and-white right up until Frank N. Furter's entrance, to mimic Dorothy's journey from Kansas. Moreover, the central story of Brad and Janet is one of innocent, pure individuals being whisked off against their will to a world they don't understand - and like Dorothy, they have to deal with many evils in their desperate bid to get home. While it retains many aspects of the L. Frank Baum story, Rocky Horror subverts or departs from key elements in a way which reveals its deeper message (if it has such a thing). While Oz has a cop-out ending where everything returns to normal, the lives of Brad and Janet are shattered forever; there is no going back to their previous lives of whitewashed churches and pastel dresses. Likewise Dorothy retains her purity or innocence throughout, while both Brad and Janet give in to temptation and find out that they actually quite enjoy it. The final song is a duet between the conflicting desires of Barry Bostwick's 'bleeding' heart and Susan Sarandon's promiscuity. One could almost liken the final scene to a sexualised restaging of the Fall, with Charles Gray looking on as a God who is criminally disappointed in his "insects". Rocky Horror has been hailed as many things in its lifetime, from a call for sexual liberation to some sort of Brechtian challenge to the role of an audience. Most of these accolades have an ounce of credibility but were not the intention of the filmmakers; no-one ever planned that audiences would start dressing up as the characters or talking back to the screen. Its sexual politics are incredibly liberal, with the message being one of accepting each other's identities and preferences rather than encouraging the 1970s equivalent of 'free love'. To suggest that Rocky Horror is a non-ironic advert for sexual promiscuity is to foolishly ignore the film's more sophisticated side. If Rocky Horror were simply a vehicle to convince people to dress up in fishnets and give in to lust, far less effort would have been expended on the dialogue and the characters. 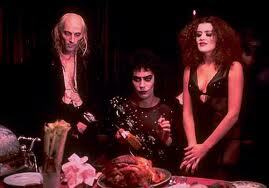 O'Brien's script is witty and in-your-face, and Tim Curry chews his way through every line with relish and panache. 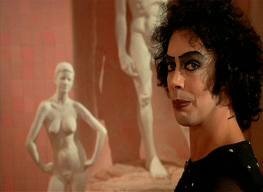 The character of Frank N. Furter is much more complex and unpredictable than one might assume; he is not just a mad scientist posing as a drag queen, or indeed vice versa. 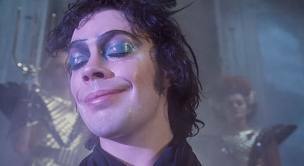 Like the story he inhabits, he flits from one aspect to another - he is equal parts bawling child, narcissistic drama queen, sexual sadist and English gentleman, and it remains Tim Curry's finest performance. It's very hard to pin down exactly what makes Rocky Horror such a hoot to watch. Some of it is inthe songs, which are brilliantly written with syllable-stretching humour. 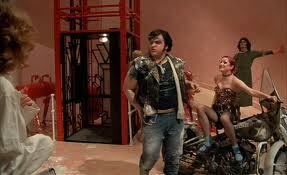 Some of it is in the action scenes, from Meatloaf riding indoors on his motorbike to Dr. Scott's wheelchair becoming magnetised. But most of it comes from the knowledge that the film doesn't really care what you think, and that the cast were having a ball. Seeing Gray dance the Time Warp on a table is one of the best comedy moments of the 1970s. 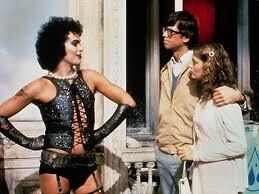 Inevitably, there are things about Rocky Horror which don't work, at least not anymore. In the final third the songs become more medley-based and the plot steadily peters out. Although the ending itself is befitting, there is a lot of filler in the floor show before we get there. This may be intentional, since cabaret shows are not known for being speedy affairs. But there is a still a sense of the film dragging and getting caught up in its own indulgences, particularly in the lengthy dance sequences. Because the plot is so much of a jumble, the film is incredibly uneven, with regard to the level of humour or horror on offer. Some scenes remain funny, others are scary, but others still seem incongruous or unnecessary. 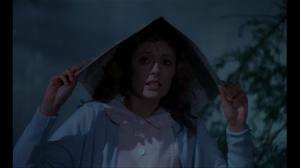 Janet's encounter with the monster ('Touch Me') is toe-curling, and the increasingly campy tone can become tiresome. Because everything is so full-on and over-the-top, there will always be some people who won't put up with all the non-sequiturs. In its darker moments the film wobbles as the desire to laugh begins to falter, and no amount of singing is going to bring those people back. 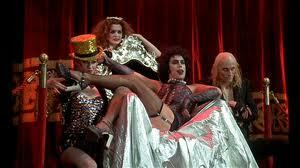 The Rocky Horror Picture Show is trashy cinema at its most enjoyable. The story may be silly beyond belief and the acting is intentionally hammy, but the music is great and the overall experience is enjoyable. The film has such alacrity, such a cheerful readiness to make you forget the outside world, that you can't help falling in love with it just that tiny little bit. It isn't by any stretch a masterpiece, or a particularly rounded work. 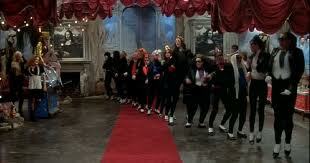 But as a musical, cult film and watershed, its importance cannot be underestimated. After my second or third viewing a while back (like 3 years ago) I felt this was the best msuical ever. Now my score it 8/10. The songs are still fantastic and as you say it is kinda 'trashy' terrific review Daniel! Great points.